Perennial; caespitose. Rootstock evident. Stolons absent, or present. 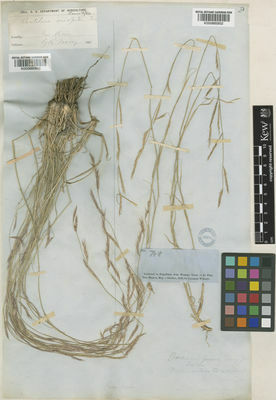 Culms decumbent; 20-60 cm long; wiry. Culm-internodes distally woolly. Ligule a ciliolate membrane. Leaf-blades convolute; 5-10 cm long; 0.5-2 mm wide. Inflorescence composed of racemes. Racemes 3-8; borne along a central axis; ascending; unilateral; 2-5 cm long; bearing 8-18 fertile spikelets on each. Central inflorescence axis 10-15 cm long; tip without extension, or subulate. Rhachis semiterete; scabrous on surface; terminating in a barren extension; extension subulate. Spikelet packing broadside to rhachis. Raceme-bases brief; pilose (woolly). Spikelets ascending; solitary. Fertile spikelets sessile. Spikelets comprising 1 fertile florets; with diminished florets at the apex. Spikelets cuneate; laterally compressed; 6-9 mm long; breaking up at maturity; disarticulating below each fertile floret. Floret callus pilose. Glumes persistent; similar; reaching apex of florets; thinner than fertile lemma; gaping. Lower glume lanceolate; 2.5-4 mm long; 0.33-0.5 length of upper glume; membranous; 1-keeled; 1 -veined. Lower glume lateral veins absent. Lower glume apex attenuate. Upper glume lanceolate; 6-9 mm long; 1 length of adjacent fertile lemma; membranous; 1-keeled; 1 -veined. Upper glume apex attenuate. Fertile lemma ovate; 6-9 mm long; coriaceous; keeled; 3 -veined. Lemma surface glabrous, or puberulous; hairy below. Lemma apex dentate; 3 -fid; with outer lobes shorter; awned; 3 -awned. Principal lemma awn 1.5-3 mm long overall. Lateral lemma awns arising on apex of lobes; 0.3-0.5 mm long; shorter than principal. Palea 2 -veined. Rhachilla extension pilose; hairy at tip. Apical sterile florets 1 in number; barren; rudimentary. Apical sterile lemmas awned; 3 -awned. Apical sterile lemma awns 4-8 mm long. Caryopsis with adherent pericarp; oblong; 2.5-3 mm long. Embryo 0.75 length of caryopsis. North America: northwest USA, north-central USA, southwest USA, south-central USA, and Mexico.